Q1: Is zero a rational number? Can you write it in the form p/q, where p and q are integers and q ≠ 0? Answer: Yes zero is a rational number. It can be represented as p/q form e.g. 0/1, 0/2, 0/15 etc. Q2: Find six rational numbers between 3 and 4. 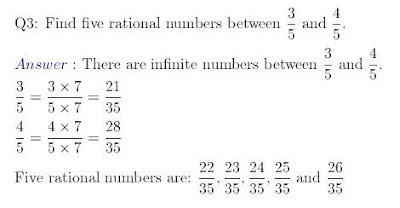 Answer: Between 3 and 4, one can have infinite rational numbers. E.g. 3 and 4 can be represented as p/q form as 33/11 and 44/11. Q4: State whether the following statements are true or false. Give reasons for your answers. Explanation: Whole numbers contains all natural numbers. Explanation: Since integers include negative numbers while whole numbers do not. Explanation: E.g. 3/5 a rational number cannot be represented either as whole number. If x, y, z are rational numbers, then x + (y + z) = (x + y) + z. (associative property of addition). 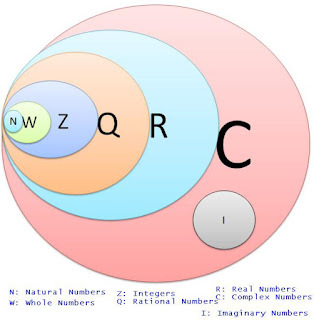 The rational number 0 is called the additive identity of rational number..
For every rational number x, there is a rational number −x such that x + (−x) = (−x) + x = 0. The rational number –x is called additive inverse of rational number. For every non-zero rational number x, 1/x is a rational number which is its multiplicative inverse. Answer: A rational number is a number which can be expressed in the form of p/q, where p and q are integers without and common factor between them. And q is not zero. A rational number may be positive, negative or zero. Q6: What is the smallest natural number? Q7: What is the smallest whole number? Q8: What is the additive inverse of -4/5? Q9: What is the multiplicative inverse of -3/8? Q10: List an integer which is not a natural number? Answer: 0, all -ve numbers are integers but not natural numbers. Q11: Is zero (0) a rational number? 2 + (3 + 4) = (2 + 3) + 4.